In many of my weekend projects, i used some cheap 433 mhz RF modules or nrf23l01 modules for wirelessly controlling lights, temperature sensors, garage door openers e.t.c. But i never thought about the security for these protocols. It is pretty easy to sniff the rf signals with an sdr (software defined radio) and replay them to control most of these simple devices and tweak in to those simple protocols. In this project, i am trying to introduce some simple securing to those rf channels. It uses the avr crypto library and the AES 128 (advansed encryption system) to perform the encryption of the data transfer between the arduinos. The principle is very simple. 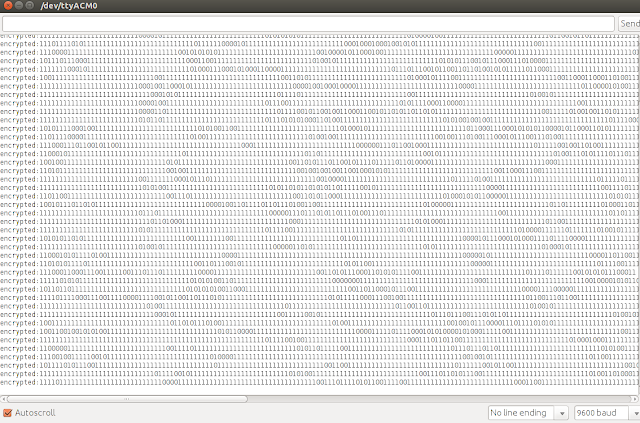 It encrypt all the packets send between the arduinos using a secret key (128 bit in this example). So it appears meaning less to a third person who is sniffing the traffic. One of the challenge is the replay attack were the person can record and re-transmit the data. To avoid this there is some data in the transmission which changes with every instances of they communication (Rolling code or code hopping). This is similar to one time codes used in for e.g banking, remote car keys e.t.c. Still there are some weaknesses in techniques which do not use a clock ( i excluded a real time clock to make it simple and for battery saving, time syncing e.t.c ). But it is very easy to add this feature in to the code. Other possibility is to use the google authentication with HMAC or TOTP (but not now ). Hello thanks for your post. It's the first post i found who someone use rf module with encrypt. I think it's important part to use encrypt when i control critical fonction like Relay or open door garage. It's like people use wifi without encryption. It's worse, because people use relay it's very dangerous. I would like know, how much time the encrypt/decrypt do ? 2- the registration in eeprom can be in other place (not a memory) because the number of writed memory in arduino is limitted. 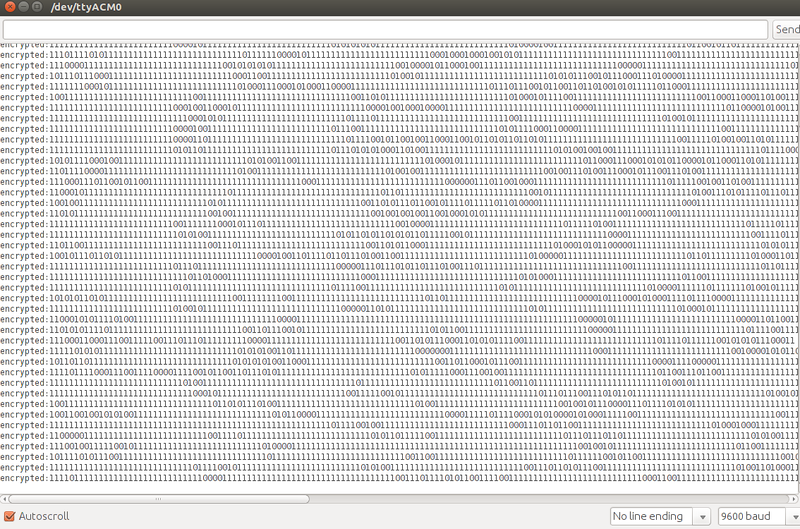 Hey, if I understand the purpose of the counter/key_counter thing, I'm not sure it works in you code... Seems that the key_counter is incremented at each loop on the transmitter side, whereas it is stored at initial pairing on the receiver side >> how the devil can it remains inside the safewindow? where is the part for rolling code? You can just encrypt and send your message. The problem is replay attacks. Instead of rolling counter, you can use a hash of (time stamp+ some secret string). There are several ways with varying degree of security. You can also keep the key in ram and attain the same results (need to use a battery backup) Goodluck with your projects! Riya: thanks for the post! Could you comment on wiring for NRF24L01's 8-pin module? Is there a need to change the code? Thanks again for the pseudo code... I assume it is for challenge-response authentication. But if I stick to the AES/one-way rolling code logic in your code above, besides loading the NRF library, anything in particular I should change? Yes, it should work. Just pass the data struct to nrf instead of virtualwire. Thanks for the NRF24L01 examples, Riya! I am able to build them and see the responses. A couple of observations: first I had to change baud rate to 9600 in sketch1 otherwise the terminal characters would turn into gibberish after a few normal outputs. Second, around 50% of the responses failed even though the sketch2 module is only 3 meters away. As I am trying to build a rolling code remote based on this article. Would these errors be a problem in this project once I adapt it for NRF24L01? So i don't have lcd for receiver so can you explain me how i can do to put the receiver in paring mode. Add seral.print for all lcd messages and use a serial monitor. Press any button on the receiver lcd. It will go to pairing mode and then connect pin 8 on the transmitter to ground. Could you explain the wiring between the LCD module and Arduino? I understand Arduino pins used (8, 9, 4, 5, 6, 7) but how are they connected to the LCD module? How is the module powered? My question is if I have a Arduino Mini, do I have to connect all pins just like how the LCD module is connected to the UNO, or only a few? Hi RiYa, thanks for your code! I have a remote with two channels that use rolling code. One channel is used to open a door gate. I would use other channel to open another door. Is it possible accomplish it using Arduino instead to buy manufacturer's original receiver? Can you tell me how to make the sender remember key_counter? I am not so familiar with eprom write. My problem is that if I disconnect sender from power I will need new pairing because the sender starts with the SAME counter every reboot, while the receiver remembers the last counter. In short: receiver writes counter to eprom, sender not. besides that your code works great, I just added a second button for sending, so that it doesn't always send in a loop. otherwise (in my case) the sender would stick to pairing loop. I would highly appreciate a sender code that also writes its key_counter to eprom. It would be ok for me to use same memory adress just as in receiver(discussed above), i need just a short hint how to save key_counter. So the changes are mainly eeprom read and write, also removed the looping in the transmit code. Just add a button to pin 9 and toggle it to transmit.